The Ford Mustang remains one of the most popular U.S. cars on the road today. The Ford Mustang comes complete with a solid array of handling features. These handling features on the Mustang include Selectable Electric Power-Assisted Steering. Selectable Electric Power-Assisted Steering permits you to have virtually effortless steering for normal conditions, for everyday driving. You can engage another option that gives you a more "sportscar" feel to your driving, as well as a closer connection to the road. Another of the Ford Mustang compelling handling features is the car's truly abundant braking power. In other words, the brake system responds powerfully and smoothly in a variety of situations. 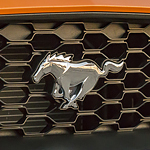 If you want more information about the Ford Mustang handling features, the experienced team of professionals at Hebert's Town & Country Ford Lincoln stand ready to assist you at your convenience.